Many features can be seen with the naked eye or with a magnifying lens of 10X to 20X power. Some of the species can be reliably identified by the wing pattern alone or in combination with head structures. 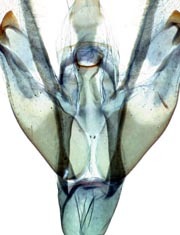 However, determination of most of the species, especially in the Gelechiidae, requires the use of a dissecting microscope of 10X to 30X power, up to 50X for the smallest Gelechiidae. Mounting of the genitalia for imaging or storage requires further equipment. If slide mounting is preferred, obtain microscope slides, cover slips, 95% ethanol, and a mounting medium that hardens, preferably Euparal or Canada Balsam. Storage in a microvial of glycerin pinned with the specimen or in a vial of lactic acid are alternatives. The alternatives have trade-offs in labor, expense, stability, distortion and discoloration, and ease of imaging that every laboratory must consider in view of its duties, workload, and resources. Examination of wing venation is a minor component. Scales should be removed from the wings with a fine art brush in 70% alcohol. For accurate identification, wings should be stained with Eosin Y or a similarly appropriate stain. Microscopic examination of larvae requires immersion of the specimen in a watch glass of alcohol or water and handling with forceps. Live larvae should be prepared by immersion in water at 100°C for 1 to 3 minutes followed by brief cooling. This allows the chaetotaxy (pattern of setae) to be examined without the distortion of the body that may follow other methods of killing. If the larvae are to be preserved for verification of an identification or as reference specimens, the specimens should be stored in isopropanol or ethanol of at least 70% concentration. For shipment, larvae should be placed in household vinegar (5% acetic acid) or in a small amount of 70% alcohol in compliance with Postal Service regulations.